Product information "ER Series Film Capacitors"
NWL’s ER-Series polypropylene DC link film capacitors offer a distinct alternative to small round cans, both film and electrolytic, with high capacitance density power in an economical standard package. The rectangular aluminum package with various mounting bracket options enables the capacitor to be operated in a variety of orientations. Component inventory, integration, and installation are streamlined as a result. Standard economic package – With standard terminals and case construction, NWL created automated assembly to enhance production efficiency. Unique stackable bracket design – Welded metal brackets enable capacitors to be mounted and stacked on floor or wall vertically or horizontally. Three bracket versions are available. 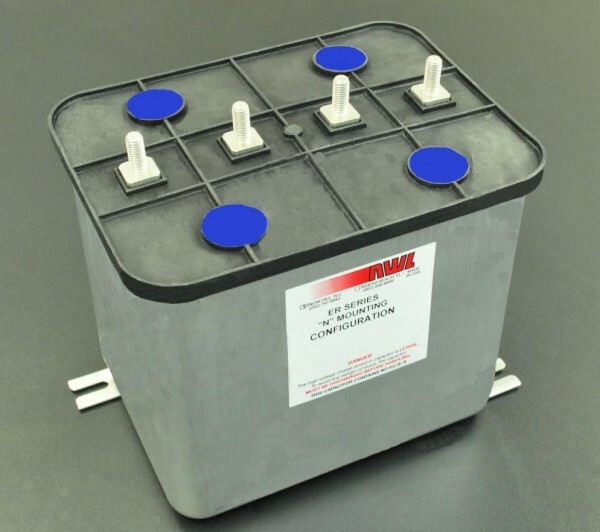 Robust, rugged, and reliable construction – ER-Series capacitors are used in numerous high reliability, mission-critical applications such as renewable energy inverters. Inverter design flexibility – Compact design and mounting options give designs more component layout alternatives. Related links to "ER Series Film Capacitors"
Customer evaluation for "ER Series Film Capacitors"